We Keep The Memory of Alfonse and Phoebe Marchand Alive!! It has been two years since Ontario celebrated the beginning of Official Tournament Shuffling in Canada. It was a “fitting event”; a commemorative Event to Celebrate the 1st Sanctioned CNSA Tournament AND to honour Tournament Hosts Alphonse and Phoebe Marchand. To keep the memory alive, I share with you just a little, as to how the Celebration got started. Stan Speaking in 2015: Hi Glen (Peltier) and John (Carson)! So glad you had the opportunity to meet >> but as you both seemed to think, just possibly you had met before!!!! Albeit some considerable time ago?? As Glen knows, and John may have guessed, I attempt to maintain “Historical items of interest” with regard to shuffleboard. I would very much appreciate receiving from each of you “The Memories Stimulated” by your conversation to-day. 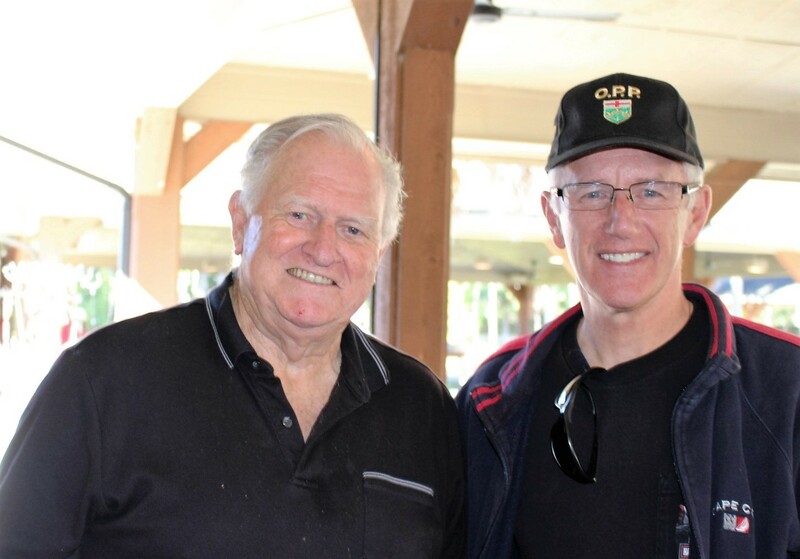 Stan’s NOTE: I had arranged with Glen and John (Grandson of Alfonse Marchand) to meet at Lakeland Shuffleboard Club on 2015 11 23. Their wonderful replies follow: Stan: 2015 11 23. E-mail from John Carson to Stan. John Carson Speaks: Firstly, thank you for taking the time to set up the opportunity to meet with Glen. 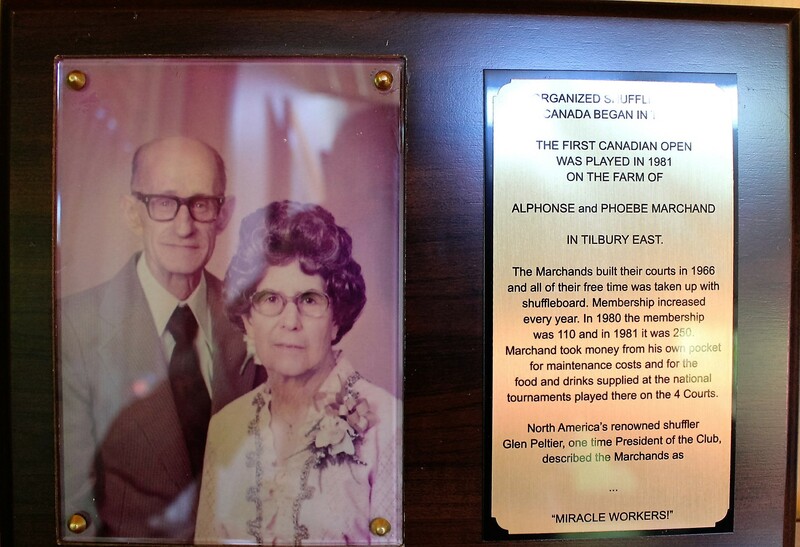 I was always aware that my grandparents, Alphonse and Phoebe Marchand were avid sports fans. During their many years of wintering in Florida, I can remember many stories about the Lakeland area. The topics would always be either about the Detroit Tiger’s or shuffleboard. In the late ‘60’s, my grandfather made it a mission to build his first shuffleboard court. With a family of six children and more than thirty grandchildren, the new shuffleboard quickly became very popular. Shortly thereafter, three more courts were built and the players seemed to come from all over. The farm on the 4th concession of Tilbury East became quite the centre of activity… and had nothing to do with farming. I actually lived in that same farmhouse when I was about four years old. It is no small pleasure to know that Glen and many others, continue to showcase, market and promote shuffleboard from the humble beginnings at the farm of my grandparents. It is also great to know that Kent County folks are playing such an important role in the sport here in Florida. I have certainly learned much about the history of shuffleboard as well as having met several individuals who are so committed to the sport. I must thank you Stan, for bringing all this to my attention. I will be returning to Ontario this weekend for our family Christmas. I will be sharing this story with my family, including my Dad, Hubert Carson, (Jean was my mother) who was a part of the years of shuffleboard in Tilbury East. I am sure they will all be pleased to know that our grandfather and grandmother’s legacy lives in such a positive manner. What a pleasure to meet John Carson today. We don’t think enough about our past but today it all came back for me. It is so hard to describe the surroundings at the Marchand farm. Large older farm house, big barns, large older clubhouse. The four courts were made to order. Cats and dogs everywhere. I cannot describe the atmosphere but I can tell you it was different and more magnificent than anything I have ever seen or will see again. Alphonse would bring his station wagon full of prizes and trophies to be given to the winners. Players came from all over Ontario and yes Michigan to be part of this club. Their daughter Hazel was the director for years but soon gave it to me. At the end of the day Phoebe always had a farm style meal for everyone. As shuffleboard spread throughout Ontario we held the first Canadian open singles on the farm. It was a huge success. One of the early members was our friend Marge Taylor. People like Nick and Vicky Klym, Jack and Peggie House, Maurice and Muriel Baker, Winnie and Austin McDonald came to every tournament. When I was very young, I watched Alphonse play fast pitch softball. He was a catcher and a good one. He and Phoebe were very good shuffleboard players. Their son Leonard often played with us. Playing there got me interested in playing in Florida. Those times will remain with me for life. Glen Peltier. This entry was posted in CNSA HISTORY. Bookmark the permalink.